The process takes a total of 21-25 business days, depending on how quickly you make and send your impressions back to us. WHAT IS THE PROCESS/PRICES SUMMARY? The first step in the process is to order the impression kit ($40), which will come with the complete instructions and necessary materials. After receiving the impression kit, we recommend your dentist taking the impressions of both your upper and lower teeth by following the instructions in the kit, which are also available on our website. Then send pictures of the impressions to us by email or phone for approval. After we approve your impressions and before you ship them to us, please make the $280 payment for one denture or $500 payment if ordering two dentures. It is important that you include the receipt of your denture payment in the same box as your impressions, and then ship them back to us using the prepaid return label. After we receive your impressions and the receipt for the dentures, we will manufacture and then mail your high quality, FDA-approved flexible denture(s) to you. ​Note: Follow the written updated instructions that came with your kit and use this video for reference only. MAY I GO IN ACTUAL PERSON AND HAVE YOU GUYS DO THE IMPRESSIONS FOR ME? Since we are a dental lab only, we do not make impressions. We recommend a dentist doing the impressions. DO I NEED TO PROVIDE BITE REGISTRATIONS? Bite registration requirement is determined on a case-by-case basis; it will depend on the number of teeth you have and the location of the natural teeth. Most of the time, bite registration requirement is determined when you email or text pictures of your impressions for review / approval. First set of putty for bite registrations will be provided free of charge. WHAT HAPPENS DURING AN IMPRESSION MISTAKE? ​As described in the instructions, additional putty charge is $9.99 per set when you make a mistake. If you need to retake both impressions, the cost is $19.98 (plus shipping cost). You will need to purchase the impression kit at full price on our website and then we will refund the difference. Keep the prepaid return label and sample teeth that you received in your first kit, as you will use that return label to send in your final impressions. IF MY IMPRESSIONS TURN OUT WRONG HOW CAN MY PARTIAL BE ADJUSTED? There are two checkpoints to see how well your impressions are taken. Before shipping your impressions, you will need to send us pictures of your impressions. 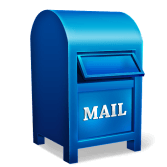 If they are not taken well, we will send you more material to retake them ($9.99 per one impression). After passing the first checkpoint, you can ship in the impressions. Once we receive them, we will inspect them and if they are taken well then we will proceed with the manufacturing process. If they are not taken well, we will send you another kit to retake them. To avoid errors, we recommend your dentist performing your impressions. ​HOW TO ASK A DENTIST FOR IMPRESSIONS? I am currently on a tight budget so I would like to order my dentures online from a reliable dental lab with over 20 years experience. I brought their complete impression kit because the dental lab only accepts VPS putty; the lab does not accept alginate impressions because they change shape overtime. May you please do just the impressions for me? HOW MUCH DOES A DENTIST CHARGE TO TAKE THE IMPRESSIONS? The dentist fee for doing impressions greatly depends on your local dentist. Some of our customers were not charged by their dentist, while others did have varying costs. Please contact local dentists to find out the charge for an appointment to have your impressions taken. WHAT IF THE DENTIST HAS A DIFFERENT PREFERENCE IN IMPRESSION MATERIAL? WHAT IF THE DENTIST WANTS TO USE HIS/HER OWN DENTAL LAB TO FABRICATE THE REMOVABLE PARTIAL DENTURES? This would be a great opportunity for the dentist to get introduced to Low-Priced Flexible Dentures. We make heat-injected dentures under high pressure, which result in denser, stronger, more precise and comfortable flexible dentures. You will save a lot of money if you purchase flexible dentures directly from our dental lab. First have your dentist do your impressions, then ship those impressions to Low-Priced Flexible Dentures, and finally you will receive high quality, FDA-approved, and affordable dentures! CAN I TAKE IMPRESSIONS IF I HAVE CROWNS? ​Usually, it is okay to take the impressions when you have crowns. However, if any of the crowns are not cemented well to your teeth, there is a risk that they can potentially come off while taking the impressions/molds. The crowns can be re-cemented by the dentist. We highly recommend consulting with your dentist with any questions or concerns. DOES THE IMPRESSION KIT INCLUDE TEETH? 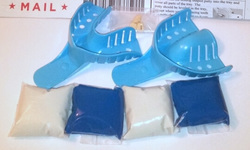 Our flexible partials are made from either TCS or Valplast; you can choose which specific material you want. Also, our acrylic resin teeth have high resistance to wear and tear, outstanding anti-discoloration properties and exceptional hardness. WHAT IS THE DIFFERENCE BETWEEN TCS and VALPLAST? WHAT GUM SHADES DO YOU OFFER? No, we only accept payments by check, credit/debit card or PayPal. HOW FLEXIBLE AND SOFT ARE THE FLEXIBLE PARTIAL DENTURES? The flexible partials are made from thermoplastic resin, which is hard plastic. 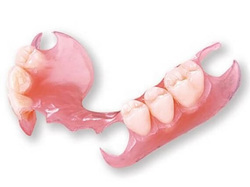 They are called flexible partials because they have more flexibility than the traditional acrylic dentures. The level of flexibility will also depend on the number of teeth missing and the location of the missing teeth. HOW LONG DO PARTIALS LAST? The time that the flexible dentures will last depends on how well you take care of the partials, and it also depends on how much change occurs in your mouth. The American Dental Association recommends replacing dentures every 5-7 years. 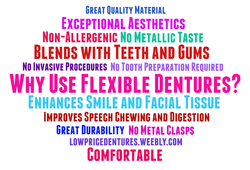 If there are any issues with your denture(s), please email us detailed description with pictures of your dentures. You have up to 30 days from the time you receive the dentures to return the product for a 100% refund, and if they are returned after 30th day but before the 60th day, we will refund 50%. Refunds will be issued within 14 days from the date that we receive the returned denture(s); this applies to both PayPal purchases and Credit Card purchases. Used impressions kits are non-refundable and the prepaid return label is valid for 1 month. Unopened impression kits that the buyer had for over a month from the purchase date are also nonrefundable. If a buyer wants to return their unopened kit that they had for less than a month from the purchase date, then the return shipping cost is the buyer's responsibility. Refunds will be issued within 14 days from the date that we receive the returned impression kit; this applies to both PayPal purchases and Credit Card purchases. "